We heard from our users that they wanted to track of all their expenses in one place to reach their goals. We listened to our incredible community and are so excited to take your businesses further. With this new built-in feature, GlossGenius members can track all of their expenses in one place, categorize them, store receipts, run reports and keep an eye on where they’re spending money. You’ll know at a glance what they’re spending and how profitable you are, without crunching numbers or keeping shoeboxes full of receipts! Easily access all expenses in one place - When you update your app, you’ll find a brand new section called expenses! Easily keep track of what you spent on, how much, when, and to who right inside your GlossGenius app. Categorize your expenses - Rent, utilities, supplies, inventory, and more--we understand all of the work that goes into doing what you love. We’ve worked with industry experts to include categories are important to your businesses’ success. Add your own custom categories too. Never lose another receipt - Just snap and store a receipt or upload one from your phone! Recurring expenses - Do some expenses like rent occur for the same amount every week or month? Just mark an expense as recurring, choose how often, and let GlossGenius automatically do the rest so you don’t have to enter it in again. Make Tax Time a Breeze - Categorization of expenses is made with tax time in mind, so it’s easy for you (or your accountant) to file. With our all-in-one system, you’ll have everything you need for taxes without all of the complexity. Keep Spending on Track & Make Sure You’re Turning a Profit - With the reporting we’ve built, you’ll know at a glance what you’re spending and how profitable you are, without the headache of spreadsheets or shoeboxes of receipts. We can’t wait to hear what you think about this feature and what some of your business goals for 2019 are. 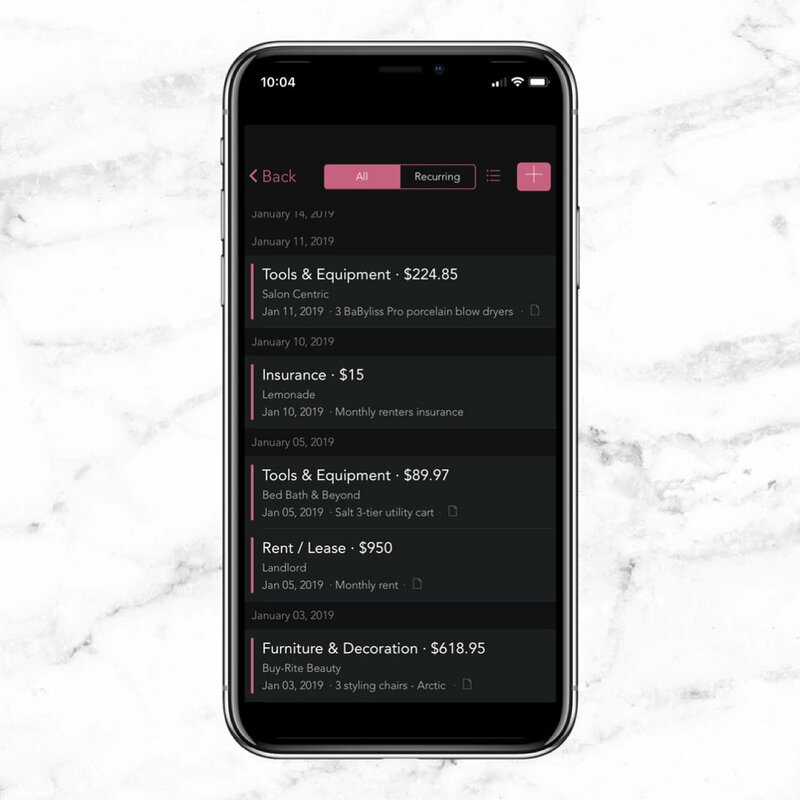 For any existing GlossGenius member, simply update your app in the app store to the most current version and you’ll have immediate access to the new Expense Management & Tracking Feature. For anyone who isn’t a GlossGenius member, join our family of business owners taking it to the next level and use the tools you need to succeed!